SHY® offer three roller blind ranges, ZIP®, Obscura® and Sunfacta®, each range provide different technical solutions and great versatility in installation. 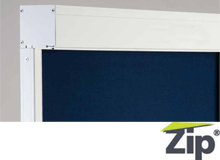 The ZIP® cassette roller blinds feature a welded zip system down each side of the fabric that is retained in a side channel. This arrangement offers virtually total light exclusion. They are available chain operated, crank opearted and motorised. Through their knowledge and experience SHY® can produce roller blinds that are small, large, very large, straight, shaped, narrow, curved, vertical, horizontal or angled. SHY® make excellent electric blinds in the ZIP® system. Wonderful hand-operated blinds, too. 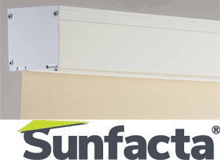 SHY® Sunfacta cassette roller blind systems are ideal for shading large or small areas. Designed specifically for the demanding contract market, the roller barrel and operating mechanism are fully enclosed in a neat headbox. With five headboxes and nine roller barrel sizes available, SHY® Sunfacta blinds can be installed on windows of many sizes - from standard dimensions up to extremely large areas of bespoke glazing. 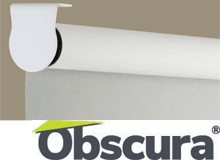 SHY® Obscura roller blinds have the look of standard roller blinds - but that is where the similarity ends! This roller blind system is anything but standard: it can provide maximum overall coverage of 70m2; has fixings/brackets for virtually any situation and clever features like counter-balancing springs, making it as easy to raise an Obscura blind manually as to lower it.